Electrical panel components that are logical control devices are electrical control components. They’re used to control the sequence of events that define how a control panel functions. Some are manually actuated like a light switch and easy to understand. Let’s focus on electrically actuated control components. In their simplest form electrical control panel components are single components (relays, timers) that perform a single logic function. In their advanced form electrical control panel components are component packages (PLC) that perform many logic functions. 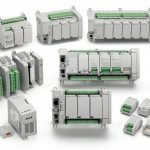 What is a Control Relay (CR)? 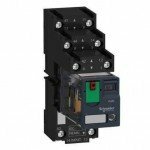 A control relay is the simplest electrically actuated control component. The simplest type is a Normally Open 1 Pole Single Throw (1PST) control relay. It’s like a light switch you use to turn a light on and off. The difference is you actuate the switch manually and a control relay actuates the switch electrically. 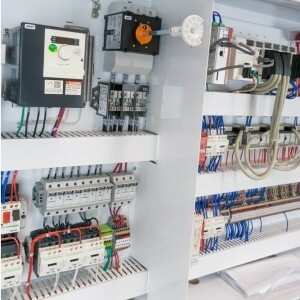 At a minimum a control relay has an electrical operating coil, a spring, a stationary electrical contact, and a movable electrical contact that operate as follows. OFF – When the coil is de-energized the spring keeps the movable contact away from the stationary contact to open the switch. ON – When the coil is energized, the coil’s magnetic field draws the movable contact to the stationary contact to close the switch. Control relays typically have 1 to 4 sets of contacts (1 to 4 pole). The number of poles defines how many independent electrical circuits the relay can control. Each pole typically has three switch contact connections (Common, Normally Open, Normally Closed). Normal describes the switch contact’s connection to common when the coil is in its normal state or de-energized. Control relays can be ordered with some useful options. The value of these options are most evident during Quality Control testing, field start-up and troubleshooting. What is a Timing Relay (TR) ? A Timing Relay is the next simplest electrically actuated control component. They are control relays with built-in timers to control when their contacts change state. Timing relays turn other devices on and off at specific times. The most common timing functions are. ON TIMER: Controls when its contacts change state after its coil is energized. OFF TIMER: Controls when its contacts change state after its coil is de-energized. 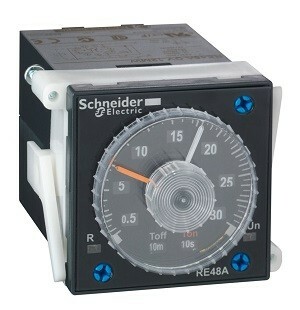 INTERVAL ON (ONE SHOT) TIMER: Controls how long its contacts remain in the energized state after its coil is energized. REPEAT CYCLE (SYNCHRONOUS / FLASHER) TIMER: Controls how long its contacts remain in the energized and de-energized state after its coil is energized (energized X seconds, de-energized X seconds, repeat). REPEAT CYCLE (ASYNCHRONOUS) TIMER: Controls how long its contacts remain in the energized and de-energized states when its coil is energized (energized X seconds, de-energized Y seconds, repeat). What is a Programmable Logic Controller (PLC) ? 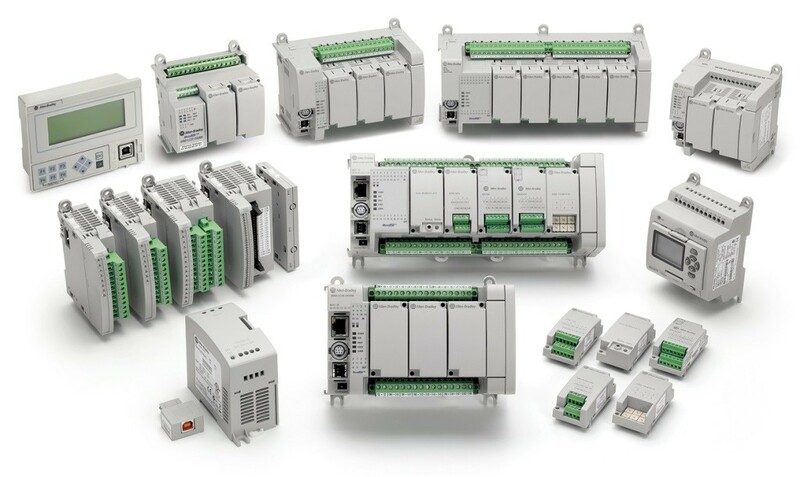 A Programmable Logic Controller (PLC) is a collection of electrical control panel components (relays, timers, etc.) in one package that can be programmed. Flexibility – A PLC can be easier to reprogram than rewiring several control components. Tools Cost – A PLC requires programming tools (computer, software, cables, etc.). Skills Cost – A PLC requires training to program the PLC to function as desired. See Best Electrical Control Components for our recommendations.